Q&A - Carl Navè tailor — everAFTER magazine everAFTER magazine celebrates and inspires a couple’s journey from their engagement through to their wedding day and beyond including lifestyle and travel. Wedding venues, bridal, fashion and styling inspiration. everAFTER magazine celebrates and inspires a couple’s journey from their engagement through to their wedding day and beyond including lifestyle and travel. Wedding venues, bridal, fashion and styling inspiration. Born in Melbourne to Italian parents, Carl Navè comes from a family of tailors and has been sewing since the age of six. With over twenty years experience honing his craft, Carl takes tailoring to an exciting new level, offering a contemporary approach to his bespoke works. Carl Navè’s Bourke Street studio offers a unique made-to-measure experience. Combining the art of bespoke creation with fashion design and textile expertise, each piece is carefully crafted with an emphasis on style, fit and comfort. How did the Carl Navè story begin? After studying fashion and working for local designers and bespoke tailors, I noticed a gap in the market. There seemed to be a lack of high quality men’s suits at affordable prices. Retailers were charging ridiculous prices for poorly made suits. My mission was to create beautifully made men’s suits, that didn’t cost the world. These suits would not only make men feel special but would have them looking sharp and stylish. In 2011, after more than 10 years working for a local bespoke tailor, I embarked on setting up my own studio to provide the men of Melbourne with more than ‘just another suit’. I wanted to create an experience and I believe I have been successful in achieving this. 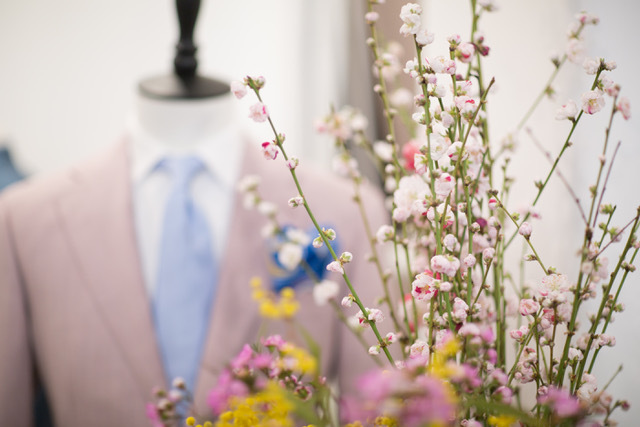 What is the process of bespoke tailoring? First of all we talk about the reason of purchase, your personal style and how you like to wear your clothing. We then look at cloth. This is often the hardest part as I have over 3000 swatches from some of the best Italian and English mills in the world. Once we’ve chosen the cloth and discussed the style and details, I take your measurements and create a pattern. The cloth is then ordered. When it arrives it is cut and a horsehair basting is prepared. This is essentially the shell of the jacket, which takes shape around you over the course of 4-5 fittings. As the fittings progress we talk about buttons, lining, stitch detail, lapel width, trouser style and much more. Why is an individually tailored suit important? What suggestions do you have for those looking for a tailored suit within a budget? You should look no further than the newly launched Carl Navè Made to Order program. It’s 100% online and offers a selection of well-made, cost effective options that allows you to buy a jacket and trousers in three different cuts and separate sizes. Each suit is individually made and delivered within 2 weeks. It’s the perfect option when you want all of your groomsmen to look the same but their body shapes vary too much to allow them to purchase the same suit off the rack. What advice do you have for grooms and groomsmen choosing their wedding suits? Keep it classic and simple. Trends come and go but a classic aesthetic, one that suits your style, body shape and personality will always remain timeless and elegant. That’s not to say you need to be boring, just don’t be a fashion victim. Even more importantly, ensure you get the right fit. This is why every man needs his own personal tailor. There are many suits I have fallen in love with over the years. My favourites usually have to do with the fabric, the detail and the client. I couldn’t possibly choose just one! Best thing about being based in Melbourne? Our seasons. We actually get four in Melbourne, which means we get to dress for four, sometimes in the same day! I know it’s often a curse, but it means I get to work on a huge range of clothing. From linen suits for summer to flannel suits for winter, overcoats and tailored Bermuda shorts. I draw inspiration from many places but mostly my family, Italy and my Italian heritage. I am also inspired by historical trends and my travels around the world. I love people watching and am inspired by how people live and have lived. I am a big believer that everything is in fashion all of the time. The rest comes down to personality and season. Mexico, to celebrate a special friend’s birthday in Tulum. I am excited to see a flock of Flamingos on the Yucatan Peninsula! I am absolutely fascinated by these animals. Their colours are beautiful and magical. The Subtle Art of Giving a F – because I always do.